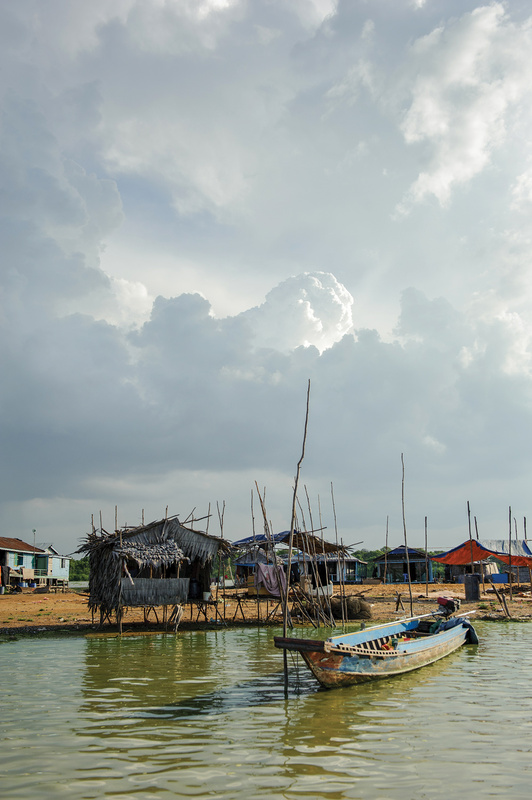 Lake Tonle Sap, Cambodia’s “beating heart,” is threatened by the competing needs of a rapidly developing nation. Can a new kind of conservation save it? There was a traffic jam on the main canal of Kampong Luong, a village that begins on the shore of Cambodia’s Lake Tonle Sap and sprawls out onto the water. My sampan slowed, then stopped, the roar of its outboard softening to a growl that let in the clamor of a working waterfront. People called out from fishing boats laden with nets and yellow, plastic fuel jugs. They haggled at floating shops buoyed by empty steel barrels and bamboo rafts, piled high with sacks of rice, bottled water, beer, eggs, fish paste, and cooking pots. Up ahead, a convoy of longboats eased a wood-​plank house with a thatch roof into deeper water. Moving is a way of life here. On a map, Lake Tonle Sap looks like a tipped-​over violin, with its neck, the Tonle Sap River, stretching southeast to join the Mekong River at Phnom Penh. Every year, monsoon rains force so much water down the Mekong that the Tonle Sap River changes direction and flows back into the lake, swelling the violin into a cello roughly five times its dry-​season size. When the rains abate, the river flows south again, draining back into the Mekong. 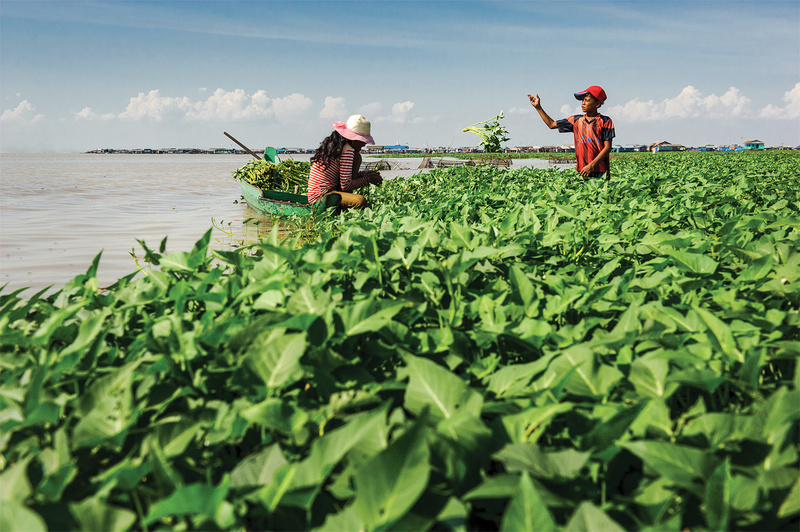 This “flood pulse” mixes aquatic and terrestrial habitats and causes a churning of phosphorous, nitrogen, and carbon that makes the Tonle Sap incredibly fertile and rich in biodiversity. Every year, the lake yields about 300,000 tons of fish, the primary protein source for Cambodians. As the lake recedes, it deposits sediment across a vast floodplain for rice and other crops and sends a glut of fish downstream toward Phnom Penh. The river’s return to a southerly flow is a national holiday called Bonn Om Touk—​three days of music, fireworks, and river races between pirogues powered by dozens of rowers. They celebrate the end of the rains and the coming of the fish, which will pour out of the lake for the next five months, feeding Cambodians as it has done for centuries. But the Tonle Sap is in danger. Overfishing, deforestation, and a hydropower boom on the Mekong threaten to choke off the lake’s vital flood pulse and the migration of fish that follow it. A changing climate, meanwhile, promises longer, hotter dry seasons and shorter, more intense monsoon floods. When I visited the lake in late January 2014, three months into the dry season, the waters were already receding. Plastic bags, bottles, and paper trash clung like ornaments to the prickly mimosa brush all along the shore. Fish heads and coconut husks lay rotting in red mud. Blankets of water hyacinth and morning glory floated in the shallows. In my sampan was a far-​flung team of researchers—​scientists, economists, and sociologists—​who had joined with local fishermen on a Tonle Sap rescue mission. The team had spent the last three days cooped up indoors, laying out what they knew and didn’t know about the Tonle Sap. Now, liberated from the conference room, they were finally out on the lake they were trying to save. While tackling any of the issues facing the lake would be daunting, Kaufman and his colleagues are taking them all on at once, because when people and nature mix nothing changes in isolation. Every choice—​from the design of a dam to the creation of fish sanctuaries—​involves trade-​offs, feedbacks, and cascades of impacts that trigger both pleasant and nasty surprises. The team’s goal is to forecast chaos, using a computer model of the Tonle Sap that tracks the interactions between natural systems (food webs and nutrient cycles, for example) and human systems (markets). The computer model’s official name is the “Multi-​scale Integrated Model of Ecosystem Services” (MIMES). The project began in 2012 with three years of funding from the MacArthur Foundation and the Belmont Forum, although the researchers say it will likely take at least five years to complete. When it is finished, it will show how people’s choices ripple through the Tonle Sap’s ecosystem and what Cambodians stand to gain or lose as a result. Building the model is just the first challenge. The second will be persuading non-​scientists, including policy makers and fishermen, to use it. The third challenge is time. The world that Kaufman and his colleagues are modeling is changing fast. Cambodia’s economy is booming, but its foundations are tenuous, built on cheap labor and the plundering of natural resources. Meanwhile, more than two-​thirds of Cambodians are under thirty, and many of them are flocking to cities or to neighboring countries for work. In theory, the model will absorb it all—​the demographic surges, the flood-​pulse changes as dams already underway are completed, and even the policy swings of Cambodia’s rulers—​and will calculate new futures for the Tonle Sap from these shifting baselines. It is not meant to be a crystal ball but a tool for adapting to inevitable surprises. Still, every system has its limits. Our boat started moving again, and Kaufman aimed a hefty camera at a white, whiskered tern perched on a nearby antenna. (Birds are another of Kaufman’s obsessions, as are snakes, trees, flowers, and bugs.) We approached a covered dock bobbing on the cusp of open water, crowded with yellow and orange hampers full of fish being unloaded by a mother and her children. Flies were everywhere, attracting a dark, darting cloud of swallows. The family huddled around their catch, setting aside larger fish, eels, and crabs, and leaving a writhing, flipping mass of silver minnows known as trey riel—​or “money fish”—​that go for ten to twenty-​five cents a pound. The family glanced at us but kept working as we inspected their catch. “Ooh! This is the first time I’ve held a recently deceased pristolepis fasciata,” Kaufman said, hoisting a yellow-​and-​black leaffish. “It’s a real turn on.” He set it on the boat deck for a photograph. His next find was a brown, bottom-​feeding goby, then a translucent glassfish, then an orange-​finned loach, followed by an Asian walking catfish. Somebody handed him a mottled green-​and-​black carp with a silver belly. “I think that’s a dangila. What a beautiful fish!” he said. “Look how protrusile that jaw is! It just pops right out. Bloop!” After about an hour, we left the family in peace. In northeast Cambodia, shortly before reaching the Mekong, the Sesan River is joined by the Srepok and Sekong rivers. 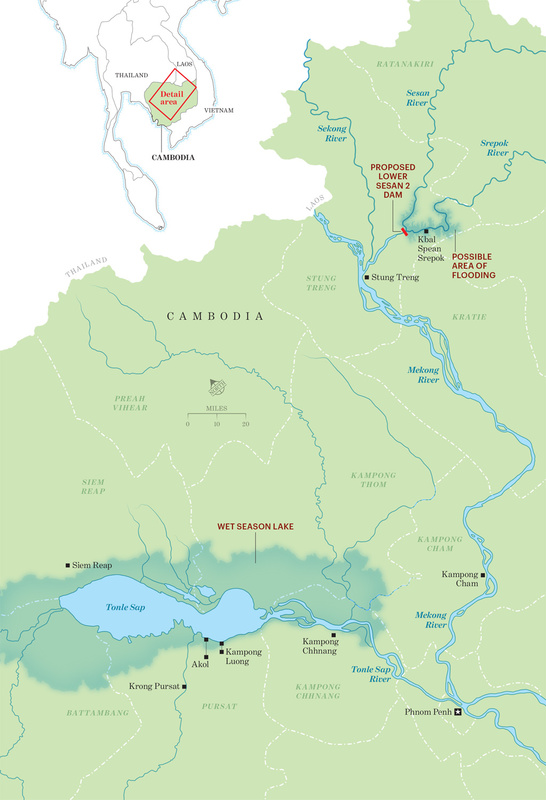 Together they form what’s known by hydrologists as the “3S Rivers,” the Mekong’s largest tributary and the closest tributary system to Lake Tonle Sap. There are more than 100 large dams in the works along the Mekong and its tributaries, reaching from China to the delta in Vietnam. Scheduled for completion in 2017, the Lower Sesan 2 Dam (LS2) is the largest of the forty-​two dams planned for the 3S Rivers. As designed, it will rise nearly 250 feet, pumping out 420 megawatts of power, and its reservoir will flood an area four times the size of Manhattan, forcing nearly 5,000 people to resettle. 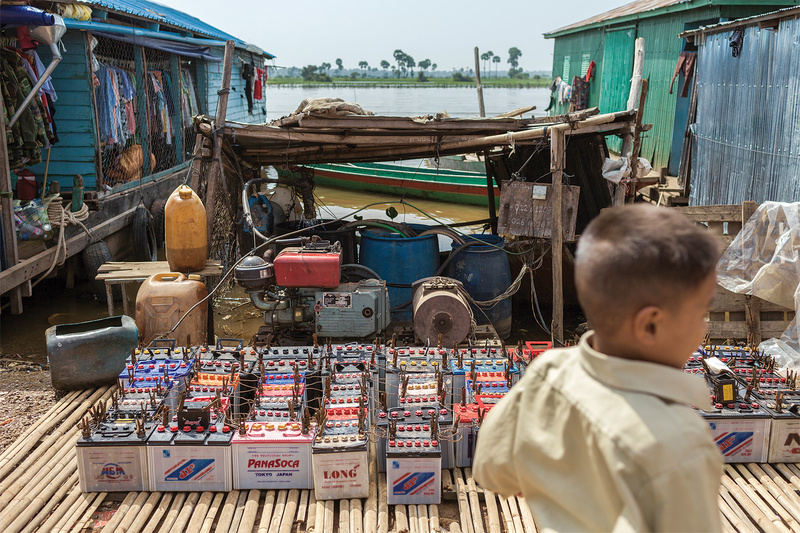 Cambodia needs more electricity to power its emerging economy and alleviate poverty, but large reservoir dams like the LS2 have high environmental and social costs, and many Cambodians—​those forced to move as well as those who rely on what the rivers provide—​will pay dearly. In Cambodia, more than half the population lacks reliable access to power, especially in rural areas, where it comes mostly from diesel generators and car batteries, and where wood serves as fuel for cooking. Even in grid-​connected cities, there are frequent blackouts during peak demand. Southeast Asia’s expanding economies are hungry for new energy sources, and governments are keen to provide them without using carbon-​heavy fossil fuels. Dams offer both, not to mention the promise of jobs and tax revenue for schools, roads, and hospitals. But Cambodians also need fish, which supply more than 75 percent of the animal protein they eat. Dams would threaten this food source in a country where nearly 40 percent of children are already chronically malnourished. In a 2014 study, hydrologists found that the LS2 and the other 3S dams, combined with a changing climate, would decimate the Tonle Sap’s seasonally flooded fish habitat, cutting the flooded forest acreage by up to 40 percent and the flooded shrub and grasslands by about 12 percent. The trade-​off is further complicated by the fact that large dams in tropical rivers have a lifespan of fifty years at most, because their reservoirs become clogged with silt. But forecasting the environmental effects of a dam based solely on its technical specifications ignores the fact that dams can be controlled—​to either store and release water to maximize electricity production or approximate the river’s natural flow, reducing its environmental impact. Compounding the environmental concerns is the political reality of large infrastructure projects in a country like Cambodia, which Transparency International ranks as one of the most corrupt nations in the world—​160 out of 177 nations in its 2013 Corruption Perception Index. The LS2 is being built by China’s Hydrolancang International Energy Company and a Cambodian business consortium called the Royal Group, whose chairman, Kith Meng, built his fortune in finance, media, telecommunications, and hotels. Meng isn’t just rich; he is what Cambodians call an oknya, a tycoon with close ties to power. In the nineteenth century, oknya gave generous gifts to the king in return for special favors. These days, oknya enjoy cozy relationships with Prime Minister Hun Sen and other political elites, securing land concessions, permits, and appointments to lucrative government posts in exchange for large investments in the nation’s infrastructure. Many oknya are also senators and cabinet ministers. Meng himself is president of Cambodia’s Chamber of Commerce and sits on the board of the Cambodian Red Cross, whose president is Hun Sen’s wife. He advises the prime minister on the economy and even travels with him to negotiate foreign trade deals. Having a Chinese corporate partner on the LS2 project also helps. Over the last decade, the Chinese have poured billions into Cambodia through business investments and “no strings attached” funding for roads, bridges, and other large construction projects. In 2006, the Chinese government paid for new office buildings for Hun Sen and his cabinet ministers, along with an international conference hall. Both were gifts, free of charge. In 2008, Key Consultants Cambodia (KCC), an environmental consulting firm, performed an environmental impact assessment of the LS2. It found that about 39,000 people living upstream from the dam would lose access to fish. What’s more, a vast amount of agricultural land would be flooded by the dam’s reservoir. And a 2009 study of the dam’s potential impacts by Ian Baird, a geographer at the University of Wisconsin, estimated that 100,000 people would be negatively affected by the dam, noting that villagers living downstream would also suffer reduced fish catches, sudden changes in water flow, and lower water quality. Shortly before submitting the assessment to the Cambodian government, KCC’s executive manager, Taing Sophanara, presented its findings to a group of environmental NGOs in Phnom Penh, who had asked for a briefing about the dam’s likely impacts. “Based purely on environmental and particularly social conditions, the project is very questionable,” Sophanara said. Cambodia’s Ministry of the Environment greenlighted the project anyway, and final government approvals were granted in November 2012. Meng celebrated with a red-​carpet signing ceremony in one of his Phnom Penh hotels, the Cambodiana. Three months later, Cambodia’s parliament, which has been controlled by Hun Sen’s party for decades, passed a law that guaranteed the developers payment for the electricity and drastically reduced the scope of compensation for rural Cambodians by focusing solely on those who would be resettled, reducing their projected number to around 4,000. The promised compensation included new homes, about twelve acres of farmland per household, basic vocational training, money for lost fruit trees, and an assortment of village infrastructure such as roads, schools, pagodas, and irrigation systems. Total compensation was set at $42 million. No mention was made of the fish, even though a 2012 Proceedings of the National Academy of Sciences study estimated that the dam would cause a 9 percent drop in fish catches in the lower Mekong, which translates to annual losses of $90 million in Cambodia. In November 2012, and again in February 2013, provincial authorities held public meetings to inform people living within the reservoir area about the resettlement sites. No documents were provided, but at one of these meetings attendees were told that villages would be consolidated and moved several miles away from the river. After learning of the dam and the extent of its reservoir, villagers delivered petitions to Cambodia’s national assembly and wrote open letters to Meng, Sen, and the Chinese ambassador, but to no avail. In the spring of 2013, loggers started clearing trees from the 137-​square-​mile reservoir, but the logging was temporarily halted in October, after villagers and community activists showed photographs of workers poaching high-​value trees beyond the reservoir’s boundaries. Early in 2014, de-​mining teams scoured the proposed dam site for landmines and unexploded bombs—​one of the first steps in any major construction project in Cambodia, where the remnants of past wars have killed or injured more than 64,000 civilians since 1979. Then the relocations began. Desolation flanked the dusty road to Kbal Spean Srepok, one of the villages that will be underwater when the LS2 is built. A dense, broadleaf forest once grew here. In 2006, the government leased more than 24,000 acres to an agribusiness company that will grow a variety of crops, including rubber trees like those we passed on the main highway—​row upon row with their trunks painted with white insecticide and belted with drip-​taps for resin. For now, there wasn’t much more than ripped-​up earth, brittle scrub, and a few jagged, lifeless trunks. Three days before the Tonle Sap modelers gathered, I had driven about 250 miles northeast of the lake to see the dam site up close and talk with people living in its shadow. 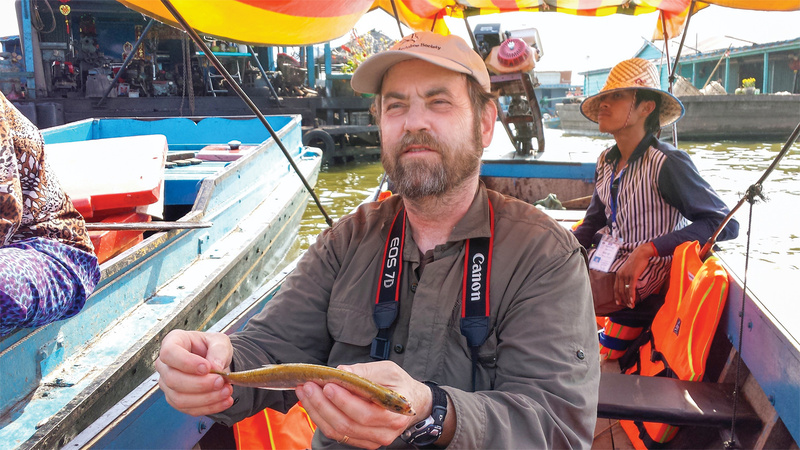 Kaufman came along, as did Lee Hannah, an environmental scientist at the University of California and a senior research fellow at Conservation International, the Tonle Sap project’s NGO partner. Neither Kaufman nor Hannah joined the sprint to Kbal Spean Srepok (the ecologists couldn’t resist the lure of the nearby Lumphat Wildlife Sanctuary), but we would reunite to visit the dam site the next day. Since the early 1990s, the Cambodian government has ceded close to 5 million acres—​an area the size of New Jersey—​for logging and rubber, sugar, cassava, and palm-​oil plantations. While holding out the promise of economic development and jobs, these land concessions have torn apart communities in rural Cambodia, home to 80 percent of the population. Traditionally, Cambodian villagers farm and raise livestock where their ancestors once did, venturing into forests to hunt or collect firewood, honey, resin, and other materials to sustain themselves. When authorities arrived, many villagers held no clear legal title to the land they were using, and it was relatively easy to buy out or bully those who did. Trucks rolled across the stripped landscape, carrying felled trees to enormous burn piles that smoldered by the roadside. The smoke and dust mixed into a hot, acrid haze that seeped into our car as we bounced down the pitted road. Eventually we reached the river, crossed an inlet over a wooden bridge, and entered the village. We passed stands of banana and cashew trees and then stopped at a sturdy, unpainted wood-​plank house that, like nearly every other structure in the countryside, was set about ten feet off the ground on stilts, to stay clear of the monsoon floods. In recent years, the floods have intensified, so newer homes are built several feet higher. As we talked, half a dozen neighbors showed up to share their accounts, as Libeak and Mean had arranged. One woman in her early sixties, named Te Sam, told of how she’d grown up in a village near the sea in Kampot Province. That’s where she and her husband were in 1976 when the Khmer Rouge moved everybody out at gunpoint, forcing them to work on massive rice-​irrigation schemes until 1979, when Vietnam invaded and toppled the Khmer Rouge from power. “During the Pol Pot regime, we lost our land, our trees, and our house,” Sam said. She’d been living in this village for twenty years, where she and her husband had cultivated fruit trees, kept a few cows and water buffalo, and raised twelve children on a small farm. Now they were being forced to leave again. I mentioned the promised electricity, jobs, and economic development from the dam. Weren’t these things Cambodia needed? For now, though, it was still on the menu. Mean suggested we order one in addition to our beef loc lac and sticky pork ribs. Kaufman eagerly agreed. “My feeling is that I cannot study a fish without eating it,” he said. Over beers, Kaufman and Mean swapped fish stories, after which Kaufman gave a shorthand version of the Tonle Sap modeling project. “Could we work together?” he asked. “My focus is on trying to stop the dam,” Mean told him. “You mean Hun Sen,” said Kaufman. On a cool morning in Battambang, I heard the dawn well before I saw it as loudspeakers called monks to prayer. Intonations mixed with a flurry of birdsong, crowing roosters, and the high-​pitched tones of pinpeat instruments kicking off three days of lunar-​new-​year celebrations. As the sky lightened, fireworks exploded in rapid-​fire clusters. For instance: How much of the energy that makes the Tonle Sap a fish factory flows into the lake with the floodwaters, where sediment and sunlight grow a banquet of plankton? How much is already there in decomposing leaves from the freshwater mangroves? The answers will be critical to projecting fish losses from dams and the clearing of flooded forests. To find out, a group led by Gordon Holtgrieve, a University of Washington ecologist, would check the fish caught by Ratha’s team for the chemical elements pointing to either aquatic or terrestrial food sources. The field team was also amassing a library of fish DNA from hundreds of species that would be matched with genetic tidbits fish shed as they swim through a given stretch of lake or river. They would also collect water samples to measure temperatures and PH levels, as well as the levels of plankton, bacteria, oxygen, methane, nitrogen, phosphorous, and heavy metals. Every data point was a dot to be connected, creating constellations of the Tonle Sap as it changed over time. Ratha explained all this with a slight British lilt that suited his fastidious appearance—​dress slacks, black leather loafers, and a pressed white Oxford shirt. He’d grown up in southern Cambodia near the Vietnamese border, where his family farmed a few acres of rice, cucumbers, beans, cabbage, and white carrots. When Ratha was seven years old, his father armed him and his brother with pistols and sent the boys into the fields at night to guard the crops. He was about that same age when he accidentally chopped two fingers off his left hand while trying to break open a palm-​fruit husk with a small ax. “I saw my parents worked very hard, but they got less and less benefit, because the rice productivity is not good,” Ratha said. His older brother and sister were both married, and both still farmed the family fields. So did most kids Ratha grew up with. Going to school is an expensive proposition in rural Cambodia, not only because it deprives families of labor, but because low-​paid teachers demand monthly “fees” from their students. This financial burden is partly why only 26 percent of Cambodians make it to tenth grade. After a coffee break, Evan Fraser, a food-​security expert, got up to talk about the human element of the model. Fraser, a tall, voluble Canadian from the University of Guelph, is cofounder of a collaborative research blog called Feeding Nine Billion (a reference to the 9.6 billion people expected to inhabit our planet in 2050). He has studied some of history’s worst famines, as well as the famines that might have been were it not for smart preparation—​such as storing food, distributing drought-​resistant seeds, and enhancing irrigation. His research suggests that no matter how much the Tonle Sap changes in the coming decades, the right adaptive strategies could mean the difference between a tolerable transition and disaster. Fraser’s group was planning to survey and interview people on the Tonle Sap about their likely reactions to hypothetical futures, such as a sudden drop-​off in trey riel or a labor shortage in Phnom Penh, a sprawling city of 2 million. The answers would help build a socioeconomic model to link to the biophysical model of the lake. The feedbacks and nonlinear interactionsbuilt into the MIMES model reflect ideas about nature that Kaufman has been mulling since 1980, when Hurricane Allen, a category-​five storm, destroyed a coral reef he’d studied for his doctoral work a few years earlier. “I realized that our whole view of ecosystems was warped by having lived through a period of stability that was unusual,” Kaufman told me. A year before the hurricane, he’d read mathematical ecologist Robert May’s analysis of how animal population grew and crashed. May’s work suggested that nature’s complexity did not tend to keep everything in balance, as most ecologists then thought. Rather, it made nature prone to wild fluctuations, thresholds, and cataclysms. “It was my first realization that chaos doesn’t mean unpredictable. It doesn’t mean random. It just means highly contingent, where everything depends on what happened last,” Kaufman said. In 2008, Kaufman learned the details of MIMES when he attended a workshop led by ecologist Roel Boumans, who had developed the ecosystem model with environmental economist Bob Costanza while both were at the University of Vermont. On his laptop, he offered me a glimpse of the Tonle Sap as it took shape one equation at a time. At first, the lake was a jigsaw of irregular black outlines that broke the lakefront into sixteen watersheds based on topography. Then Boumans clicked through a few drop-​down menus. Using satellite and other remote-​sensing data, he filled each watershed with various shades of green, yellow, brown, and blue to represent grassland, forests, open water, and other attributes that underlie the model. In addition to these attributes, the model will have agents, including fish and, eventually, people. Agents make decisions, whether instinctive or rational. They interact and cross boundaries. They alter a watershed’s attributes and, in turn, react to those changes, either on a clock (hourly, daily, annually) or based on certain thresholds (for example, when enough fish migrate into an area, they attract predators and fishing boats). These relationships are governed by algorithms of contingencies woven into the model. In the version of the Tonle Sap model that Boumans showed me, there were no people yet. There weren’t even any fish. But there was water. Returning to the pull-​down menus, Boumans tapped into 10,000 days of historical data from water-​level gauges in the lake. Dark blue splattered across the map as the lake grew, then changed to light blue as the lake receded to signify shallower water, fading to white on dry land before expanding into deeper blue again over time. “This is the hydrological signal, the pulse, that runs through the model,” he says. It’s the first story the model tells—​about how water and land mix. The next story, spun from the first, is how the sediment carried by the water spreads across the floodplain, which he showed in reds and oranges. “We expect that denser vegetation allows the least wave action, which lets more sediment filter out, like in these flooded forests,” Boumans said, pointing at a strip of dark green. The difference is significant to fish, since some species like it muddy while others need clear water to find food. Boumans stressed to me the iterative nature of modeling, adding that only when the model’s basic stories about the lake match observed reality can the hypothetical questions be asked. What if climate change lengthens the dry season? What if sediment sluice gates are installed in these three dams? What if fishermen agree to larger no-​take zones on the lake? What if all the flooded forests disappear? There is a range of other ecosystem models that make similar calculations. At one end of the spectrum are models that gather the opinions of experts or informed stakeholders to assess broad threats and changes to a landscape. Others use well-​vetted equations from the scientific literature on ecosystem functions to measure the one-​time trade-​offs of, say, building a new highway through an old-​growth forest. MIMES is at the far end of the spectrum, playing out multiple trade-​offs across space and time. It also tracks feedbacks—​such as the way people not only alter nature but then react to those changes. Non-​scientists won’t get their hands dirty working with Boumans’s model directly. Instead they will use a much friendlier piece of software called MIDAS (marine integrated decision analysis system), which is being built by geographer and modeling expert Suchi Gopal, Kaufman’s colleague at Boston University. Developed in tandem with MIMES, MIDAS is meant to be more like a computer game—​place your dams here, a no-​take fishing zone over there, dial up global temperatures a bit, and watch what happens. MIDAS will feed the choices into the world of the model, and then it will spit out animated maps and other displays showing the likely futures. A flowchart of the Tonle Sap model is a scramble of boxes showing the inputs and outputs of the ecosystem—​water, vegetation, migrating fish, and fishermen—​hitched together by branching lines of decision points and feedback loops. Several arrows ring the perimeter, circumventing the entire intricate enterprise. These represent “exogenous forces,” some of which, like climate change, are well anticipated by the modeling team. Others, such as the regional sway of China or the corrosive effects of corruption, are harder to grasp with algorithms. Nevertheless, these forces could shake up this carefully modeled world like a snow globe. So the model must be flexible enough to absorb them and offer realistic options for adaptation. For example, while it’s possible that people building hydropower dams could use MIMES, most of the dams are planned beyond Cambodia’s borders. At the international level, development on the Mekong is guided by the Mekong River Commission (MRC), founded in 1995 by Cambodia, Laos, Vietnam, and Thailand, which produces copious scientific research into hydropower, irrigation, fisheries, and other major issues on the Mekong but lacks real authority. By treaty, member nations of the MRC, which did not respond to interview requests, must submit any hydropower plans for the Mekong to a “prior consultation and review”—​six months of study and grievance-​airing to reach a consensus about whether the project should go ahead. But in the first major test of this process, when Laos proposed the 1,285-​megawatt Xayaburi Dam in 2010, the Mekong’s first dam outside of China, consensus proved impossible. The MRC raised major concerns about the dam’s impact on fisheries and recommended postponing all mainstream dams for at least ten years. Laos, which aims to be “the battery of Asia,” ignored the advice and officially broke ground on the Xayaburi in 2012. Laos plans to begin construction on another large Mekong dam, called the Don Sahong, in November 2014, just a mile or so north of the Cambodian border. 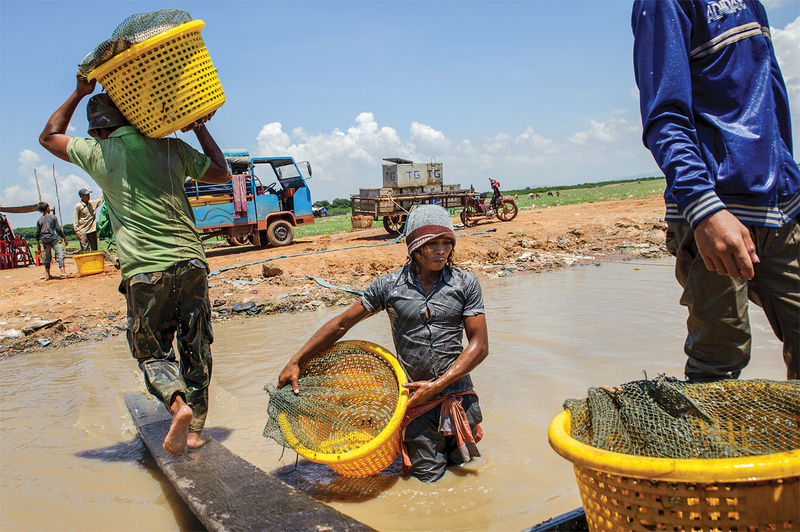 At the national level, the Tonle Sap modeling team has a good working relationship with the Cambodian Fisheries Administration, but they must tread carefully. The need for delicacy goes beyond the usual tact required of international groups meddling in domestic affairs. Hun Sen and his oknya aren’t used to discouraging reports suggesting they change course or temper their ambitions. That leaves fishemen as the most likely users of the Tonle Sap model. The lake is going to change, and they’re going to have to adapt to it. Systems are more than the sum of their parts,and MIMES is designed to spot the surprising results that emerge from their complexity. For example, what does fishing pressure actually do to the lake’s fish populations? 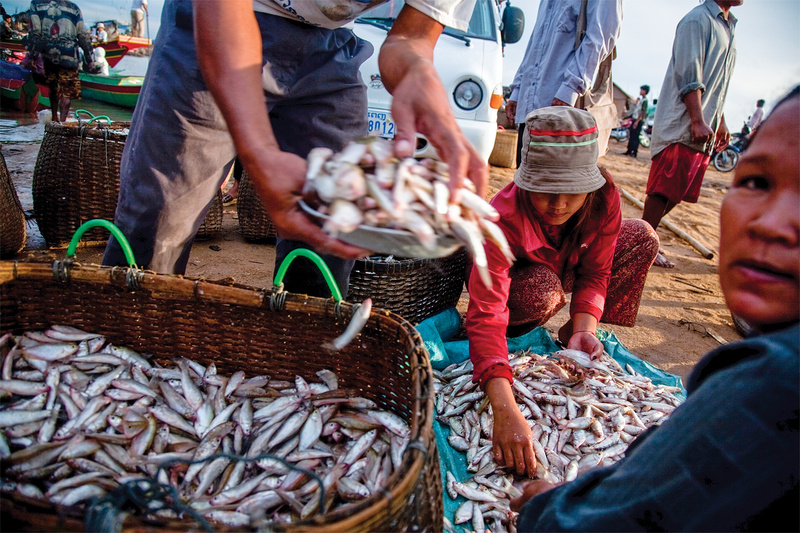 If Tonle Sap fishermen go after everything, rather than target certain species, then that may lead to the counterintuitive result of more fish. That’s because indiscriminate fishing has a greater impact on populations of slow-​growing big fish that prey on fast-​growing small fish, which replenish their numbers faster, especially when freed from predators. One of the Tonle Sap research groups is investigating this scenario, and so far the catch-​report data indicate that Tonle Sap is indeed losing its big fish while the catch numbers are up slightly for tiny trey riel. The economic trade-​off is that the big fish are worth more money. Ecologically, the system becomes less biodiverse and likely more fragile, with less of a buffer against such external shocks as diseases, invasive predators, habitat loss, and rapid climate change. Nobody knows precisely what a changing climate has in store for Cambodia. Some models suggest the main effect will be longer, hotter dry seasons. Others predict more intense monsoons and floods in the wet season. The one thing the models agree on, however, is that there will be less predictability. As the feedbacks of our choices play out, MIMES tallies up the trade-​offs. “It doesn’t tell you what you should choose,” Boumans said. It’s an accounting system unfolding through space and time, “highlighting what you’re gaining and what you’re losing.” Lurking behind that ledger, however, is a real foreboding. Boumans and Kaufman are among a sizeable contingent of ecologists who believe we are rapidly pushing the Earth beyond its carrying capacity. Of course, extrapolating catastrophe from current consumption trends is nothing new. In the late eighteenth century, the reverend and economist Thomas Robert Malthus predicted that a fast-​multiplying humanity would eventually doom itself by outstripping the Earth’s ability to provide food. For the next two centuries, however, the world’s population kept growing, and the global calamity never happened. Still, by the late 1960s, ecologists, led by Paul Ehrlich and his 1968 book Population Bomb, again took up the Malthusian banner, insisting that the reckoning had only been deferred. This time, it wasn’t just our food supply that was at risk, it was breathable air, clean water, and the other natural systems that made Earth habitable. Countering the Cassandras were economists who said Malthusians, both then and now, overlooked the power of markets to alleviate scarcity through trade, resource substitution, and technology. The debate echoed in the conversations I overheard in Battambang. What exactly did it mean to save the Tonle Sap? Agreement wasn’t easy, even among ecologists who put price tags on nature and its “ecosystem services” and economists like Chris Costello, a resource economist from the University of California, Santa Barbara, who agree that natural resources are limited and want to incentivize conservation. During the morning presentations, Costello had repeatedly challenged his colleagues—​questioning theory, sniffing out bias, pointing fingers at the assumptions and suppositions that could skew research findings. Costello wanted to design experiments to test out different economic incentives on the Tonle Sap—​such as paying fishermen to adopt certain gear types or implementing profit-​sharing arrangements across villages. At lunch, he and Kaufman sat next to each other with plates piled high with spicy shrimp and vegetables, followed by a tureen of tapioca and bananas, all served outside on the university’s main quadrangle. Kaufman asked Costello how the projects’ goals could be best aligned with the real concerns of people on the lake. On our second day on the lake, we visited the village of Akol, where I met Keo Mao. In his early forties, he wore a thick mop of dark hair and a ready smile that crowded out his other features. His small hands were heavily calloused from decades of work on the water. Mao grew up in a fishing family, has always been a fisherman, but said he didn’t want this life for his five kids. Originally from Kampong Luong, Mao moved to Akol when he married in 1986. He lives in a blue, shotgun house of four rooms at the edge of the village, where the channel divides into small creeks weaving through the scrubland. A bamboo pigpen is lashed to his house, along with an aquaculture cage where he raises giant snakehead fish. He had a vegetable garden, too, before it was crushed during a violent, two-​day storm. Mao wasn’t fishing the day we met. Along with a few other fishermen, he earned part-​time cash helping Conservation International track the health of the lake, collecting fish from sampling nets, taking notes, recording the species, size, and weight, and snipping off a bit of tail for DNA analysis. He knew the lake’s troubles just by looking around. “There are too many people,” he said plainly. There are still plenty of fish, but more and more people are going after them. Cambodia’s population is growing by nearly 2 percent a year. 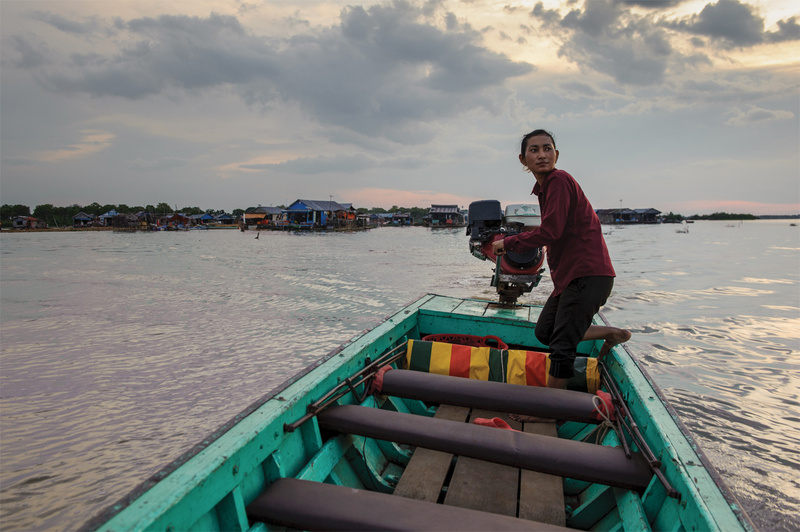 Many rural Cambodians have migrated to the lake from upland areas in recent years, often displaced by government land concessions to large agribusiness. Others have arrived here after selling their land to pay off debt. Between 1998 and 2008, the most recent census data available, the number of full-​time fishermen on the Tonle Sap increased by 38 percent to 38,200, and the number of lakeside farmers, many of whom fish part time, increased by 33 percent to 520,800. 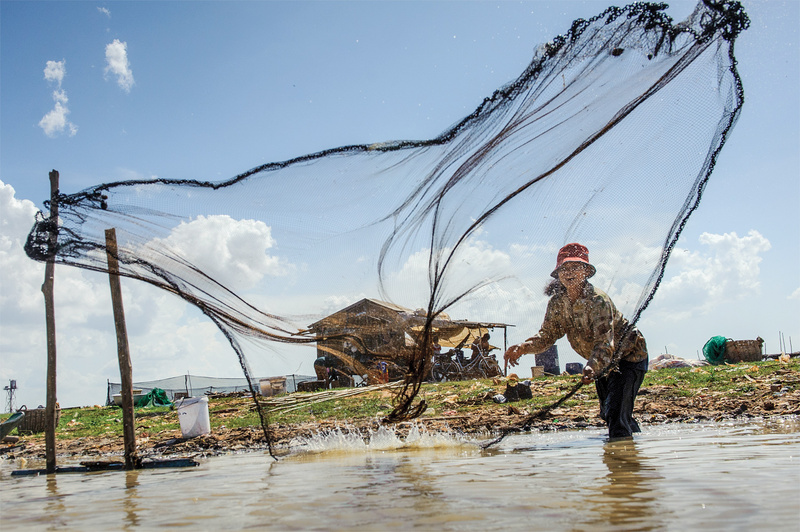 The Tonle Sap lake is currently divided into hundreds of community-​managed fisheries, along with newly designated conservation areas—​a change long advocated by fishermen who were tired of wealthy people securing the fishing lots, hiring a few locals for harvest, and excluding most others with bamboo fences and AK-​47s. But when the lot owners left, the weakness of community governance was clear; today, most villages cannot properly police their bit of the lake, and illegal fishing is rampant. Mao agreed to introduce me to other fishermen. Sor Ratha came along to interpret. We headed out in Conservation International’s fiberglass skiff. Not far after we hit open water, we met Yom, a middle-​aged woman with her hair tied back and a severe expression. Yom talked while keeping her eyes on her work, sitting cross-​legged in the bow of her boat and tugging at a net floated by a line of empty, plastic water bottles. Trey riel appeared one at a time, separated by several inches of empty net. She plucked them out and tossed them in a large white bucket. She expected about fifty pounds of fish that day, but claimed that another fisherman had just left with about 400 pounds, using a net of illegally fine mesh. “It is a thief’s net!” she laughed, adding that he was fishing in the preservation area. She pointed to a pole sticking out of the lake about a thousand feet away that marked its boundary. For wildlife rangers, arresting people for fishing illegally is a serious investment of time and money. First the suspect must be taken to the mainland, where charges are filed amid copious paperwork. The arresting officer must then travel inland again for trial. There is no budget for this tedious process, so officers mostly give warnings instead, or the nets are confiscated, or there’s a small fine paid directly to the officers. In 2013, law-​enforcement records indicate that authorities seized more than 12,000 illegal nets and traps but made no arrests. We left Yom and headed back to the village, pulling up to the house of another fisherman, Thol Thoeun, an easygoing twenty-​seven-​year-​old with rangy sideburns who was taking a rare day off to celebrate the new year, his house festooned with red lanterns and colorful paper garlands. Like many others, Thoeun came from inland to this lake. “Honestly,” he said. “Life over here is not an ideal one. It is so difficult. When there is a heavy rain and wind, sleeping is impossible.” Not only did the house rock and pitch violently, but Thoeun’s boat took on water, which meant he had to keep bailing it throughout any storm, day or night. “If I sleep, the boat would be sunk.” He smiled broadly as he continued his tale of woe: Rats ate up his vegetable garden; storms often damage his house, and the repairs take all his money. “Not only me, but everyone is suffering,” he said. Indeed, the people living on the Tonle Sap are among the poorest in Cambodia. More than 70 percent of households there earn less than $1,000 a year. Accounting for the cost of gear, boat maintenance, and diesel, this means that many are in debt, owing nearly $780 on average, according to the Cambodian Fisheries Administration. Rather than turning to banks, most fishermen borrow from families or middlemen who buy their fish and then lock them into below-​market prices in lieu of charging interest. A few minutes later, we were joined by Thoeun’s wife, Keo Sophana, and their two children, a shy, seven-​year-​old girl and a giggling four-​year-​old boy who rolled into his mother’s lap. Sophana showed us the fish she was smoking over charcoal in the kitchen at the back of the house. A pile of firewood sat beside the smoking cabinet, next to pots of rice and bean sprouts, near a fishing net folded into a green tarp. Inside the cabinet, skewers of decapitated snakehead fish, each about a foot long, lined a rack above a blackened brazier, surrounded by ash. They smoked for about twenty minutes a side until slightly charred. From outside, we heard the sound of fishing boats returning from the lake, heading home for lunch. We said our goodbyes and headed off toward what appeared to be a wooded shoreline. But as we approached, watery gaps opened up between the trees. We slowed down as we slipped into a flooded forest, where the water lapped against the trunks. Grey heron, river tern, and blue-​tailed bee eaters peeked out from the trees’ bright-​green crowns. When nineteenth-​century French explorers crossed the Tonle Sap on their way to the Angkor Wat temples hidden in the jungles north of the lake, these forests were so dense that the oarsmen stopped paddling and instead used hooks to pull the boats from one tree to another. It’s estimated that only about 3 percent of the original forest remains. 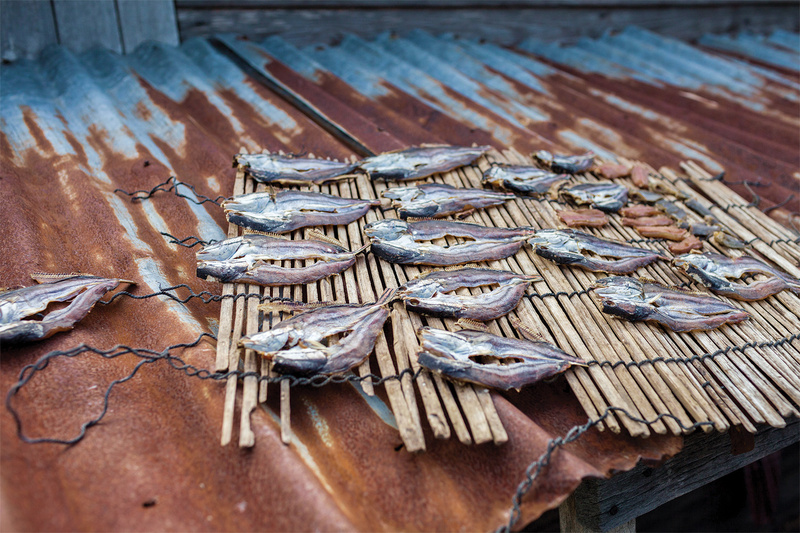 The wood has been used for cooking, building houses, and making fish traps. Still more trees have been cleared for expanding rice farms, and by fires set accidentally by upland dwellers who hunt during the dry season. While modeling the Tonle Sap’s natural systems is hardly straightforward, forecasting the motivations and decisions of people who live here may be a much more difficult puzzle. A generation of research has shown that our choices arise from a stew of emotions as much as they do from rational calculation. I caught a glimpse of one such factor as we emerged from the flooded forest, weaving through a thin patch of mangroves standing like sentries by the open water. Nestled in one treetop was what looked like a birdhouse made of wood and corrugated tin, with white sides and a green roof. Two red flags flanked the entrance. A branch ladder led up from the water. I tapped Ratha’s shoulder and pointed. “Neak ta,” he said. “That is neak ta’s house.” Neak ta, he explained, is a spirit of the natural world, a local guardian of the soil, trees, and water. According to the Cambodian anthropologist Ang Choulean, it also means “two in one,” a combined spirit of the land and the ancestors who settled it. Neak ta isn’t just in the countryside. Everywhere I went in Cambodia—​from the riverside villages on the Sesan to the bustle of Phnom Penh—​I saw ornate miniature houses painted orange and gold, standing in front of homes and outside of stores, hotels, restaurants, and gas stations. Almost anywhere Cambodians cleared land, they put up a house for the land’s spirit to occupy, and these almost never lacked some small offering—​a bouquet of marigolds, a cluster of magenta lychee fruits, a jar of incense, or a bottle of water. For small problems, a piece of fruit may satisfy the spirit. An offering of roast chicken or pig might be needed to ward off real trouble. The villagers on the Sesan pray to neak ta at a stone shrine where the river narrows upstream from the LS2. At an elaborate ceremony in 2011, they sought protection from the coming dam but could not stop it. On the northern outskirts of Phnom Penh, Heng Kong’s village faces the Tonle Sap River and backs onto a man-​made desert where, every quarter mile, a pair of large, green slurry pipes belch sand pumped by thunderous engines from barges along the riverbank. Kong, thirty-​nine, a doctoral student in fish ecology, is part of the field team that will track the feeding and migration patterns of Tonle Sap fish for the researchers modeling the lake. One morning in early February, he escorted several members of the modeling group to see the dai fisheries—​large fishing boats set up in rows across the Tonle Sap River that use 400-​foot conical nets to catch masses of fish flushed from the lake at the outset of each dry season. When Kong first came to this village in 2000, he worked for a program funded by National Geographic that paid the dai fishermen to report, measure, and release endangered giant river fish. According to Kong, the dai still hauled up one or two giant catfish or giant barb every year, but the numbers were down about 80 percent from a decade ago. The fish are smaller now, too. The river monsters hauled in by the dai nets used to weigh up to 600 pounds, he said, as heavy as a black bear. Now they were about half that much. A launch arrived to motor us out to a large, moored platform with a blue, tin roof, and cabins on either end—​one for housing the crew and one for storing nets and other equipment. Four such platforms stretched across the river. About a hundred yards upstream, there were an equal number of heavy, wooden booms fixed to bamboo rafts. When the fish were running, the booms pulled open the gaping nets, which funneled to a close just beyond the fishing boats. A steel cable ran from a winch across the center platform at shin height, up to a series of pulleys on a spar that swung over the river, then down into the water, where it hooked the narrow end of the net. From November through March, the numbers of migrating trey riel follow the lunar cycle, peaking just before the full moon, which we were well past. For several days during the peak period, nets are hauled in and emptied every fifteen minutes, around the clock. According to Kong, each haul could bring about a ton of fish, worth about $250. Flotillas of small craft ferry fish buyers back and forth between the fishing boats and the riverside, where many set up camp for the season. Occasionally, a large Vietnamese fishing barge will haul away ten tons at a time. We showed up on a slow day. On the boat operated by Kong’s family, part of the net was drooping from the pulley. Two men hit it with sticks to clear debris. Another man, shirtless, climbed into a dinghy and poured a few buckets of water over himself as a makeshift shower. A fourth man relaxed in a hammock, checking his smartphone. A boat arrived to deliver hundred-​pound sacks of rice flour, which feed the aquaculture catfish being fattened below deck. Then, likely for our benefit, the crew hoisted a smaller dip net. They tipped it over a large sorting tray, and out poured a silver stream of fish. The men used green, wooden squeegees to separate the fish from a mess of wrappers, chip bags, toothpaste tubes, and other trash. The ecologists flocked like birds to the sorting tray. There were five such satellite cities already under construction in and around Phnom Penh. Steps from my lookout spot, a new bridge crossed from downtown Phnom Penh to Koh Pich or “Diamond Island,” an expanse of wide new boulevards, condominium complexes, and corporate office towers. The island was still growing. A tall revetment extended into the river about 1,500 feet from freshly dumped sand on its northern point, marking a new perimeter. Several of the buildings were half-​finished. Tower cranes were everywhere. The streets were mostly empty. The oknya developing Diamond Island, Pung Kheav Se, planned a skyscraper more than 1,600 feet high, a new bridge to the island shaped like a giant butterfly, and a 750,000-​square-​foot commercial-​and-​residential complex called the Élysée that would resemble Parisian apartments, with a replica Arc de Triomphe at its center. 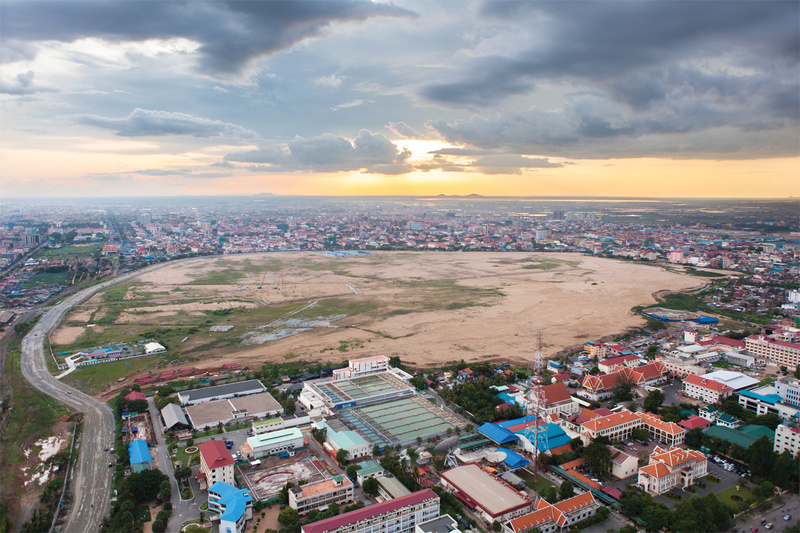 In the summer of 2013, Cambodia’s Ministry of Land Management, Urban Planning, and Construction announced plans for a new capital city of glimmering high-​rises, spreading northeast from Phnom Penh, designed to resemble a dragon’s head from the air. It would be an $80 billion mega-​project in a country where the entire national budget is only $3 billion. Describing the plans for this new metropolis to reporters, a ministry official waxed philosophically about Cambodia’s national destiny. “If we study the history of any country, after you have great progress and then stability, you must have a new city,” said Phoeung Sophoan, the ministry’s secretary of state. Now, Cambodia is in the “Hun Sen period,” Sophoan explained. The new capital would be named Hun Sen Dragon City. After dark, Phnom Penh’s waterfront was crammed with tourists and expats, mingling with young, upwardly mobile Cambodians. I wove through the crowds and the stores displaying their wares on the sidewalks—​everything from jewelry and perfume to rosewood coffins inlaid with teak. I passed tattoo parlors, internet cafes, cell-​phone shops, Irish bars, Lebanese shawarma stands, pizza joints, and taquerias. The riverside park on Sisowath Quay was lined with sugar palms lit up like Christmas trees. Entire families operated small kitchens hitched to scooters, selling garlic-​grilled pork and pickled daikon, salt-​dried fish, dragonfruit, and pineapple. The river reflected the red and green deck lights of the barges lumbering upstream. Around midnight, I took a tuk tuk back to my hotel. On my way to the front door, I heard my name called from across the patio. Kaufman and Hannah were at a table by the pool. A bottle of wine was between them, turned upside down in a bucket of ice. They waved me over. “We’re celebrating the memory of a friend tonight,” Kaufman told me. The friend, Stephen Schneider, was an environmental scientist at Stanford, a climate modeler, and one of the first prominent voices to advocate for sharp reductions in greenhouse-​gas emissions. Schneider and Kaufman had known each other professionally for about a decade when they were both diagnosed with cancer. They began writing and calling each other for mutual support. When Kaufman’s doctors kept him in isolation for months after his bone-​marrow transplant, he says, “talking with Steve and his wife, Terry, kept me from going insane.” Like Kaufamn, Schneider beat his cancer. But he died unexpectedly of a pulmonary embolism in 2010, at age sixty-​five. Kaufman said, “We’ve been toasting Steve. And trying to keep from despairing.” What had been accomplished by thirty years of climate research and modeling and the warnings of Schneider and other scientists? Kaufman recalled the day in Ratanakiri when he and Hannah went off to explore the Lumphat Wildlife Sanctuary. They never found it. More precisely, they found what was left of it: The reserve had been carved up into land concessions for plantations in 2011. Environmental NGOs had devoted millions of dollars and countless hours to protect the environment in Cambodia, Kaufman told me. What was there to show for it? The forests were gone. The dams were coming. The fish were disappearing. More than once, Kaufman compared MIMES to the fictional, predictive science of psychohistory from Isaac Asimov’s Foundation Trilogy. Asimov’s semi-​mythical character, Hari Seldon, the founder of psychohistory, foresaw the end of a galactic empire followed by an era of barbarism. He created “The Plan”—​a masterwork of algorithms used to guide the universe toward a series of predestined outcomes—​in order to hasten a new civilization. But there’s something vital missing from that analogy: chaos. The Tonle Sap model can’t plot a single course toward a sustainable future. It is a tool for exploring “what ifs” spun from changing circumstances and buffeted by forces beyond our control, a constant work in progress. In that sense, the same chaos and contingencies that make modeling the Tonle Sap so maddening could also be heartening, opening possibilities for discovery, experimentation, and surprises. Cambodia is bracing for what demographers call a “youth surge,” with more than a fifth of its population between fifteen and twenty-​four years old. Increasing numbers of them are educated, online, and plugged into the world around them. What kind of future will they seek? Chris Berdik is a freelance science journalist and a former staff editor at the Atlantic and Mother Jones. His first book, Mind Over Mind: The Surprising Power of Expectations, was published in 2012 by Current, an imprint of Penguin.